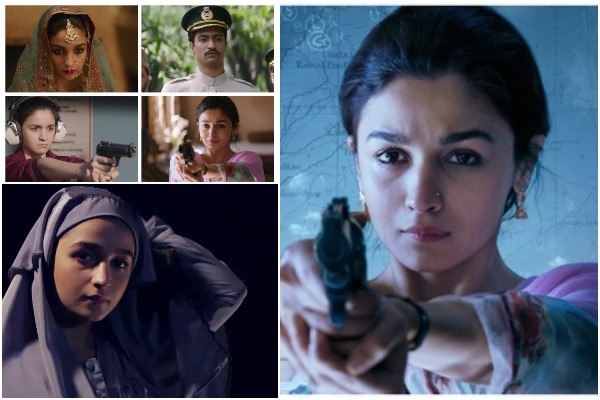 Meghana Gulzar’s directorial “Raazi” trailer starring Alia Bhatt as Indian spy is tale of unsung hero whose sacrifice and work is off the records. We all started taking Alia Bhatt’s acting talent seriously after her crisp performance on relationship problems and romance based movie “Dear Zindagi”, directed by Gauri Shinde. Yet again, Alia Bhatt delivers another ground breaking performance as an Indian spy, being married off to a Pakistani soldier(played by Vicky Kaushal). ‘Raazi’ is based on Harinder Sikka’s novel Calling Sehmat, directed by Meghna Gulzar. Alia Bhatt portrays Sehmat’s role as – A daughter, A wife and A Spy, each character is equally justified. Raazi is set during the 1971 Indo-Pakistan, where a Kashmir based girl is asked to be an Indian spy and get married into a Pakistani family. Vicky Kaushal plays the role of Pak soldier who gets smitten by Sehmat’s simplicity and beauty, without realizing that she is an Indian spy too. This is Alia Bhatt’s best performance till date and we loved her as Sehmat in Raazi trailer. Well, we cannot take Alia on light side, be it her acting or her IQ. Lately, Alia Bhatt has become choosy about doing films and her acting prowess has made her one of Bollywood’s finest actress. Do not miss to watch Raazi on May 11. Raazi is produced by Karan Johar’s Dharma Productions along with Junglee Pictures.